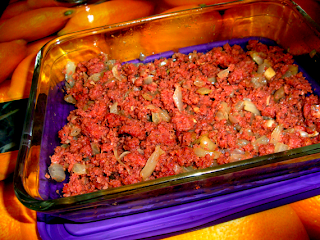 There are little variations in making corned beef Filipino style. One simple way I learned from my parents is cooking Hereford corned beef (our favorite brand) with sautéd onions and garlic, salt, and pepper. Other ingredients you can also add are diced potatoes, tomatoes, bay leaf, and MSG. My mom told me when she was growing up in the Philippines, corned beef was expensive because it was imported from the US. So this was considered a delicacy to her generation. This must be the reason why my parents always have a can of corned beef in their pantry!